So after a recent traffic ticket (no, I didn't mention it here - jeez, I don't have to tell you guys EVERYTHING, do I?) I found myself sensitized to the local police presence. Hyper-sensitized. To the point of wondering "Wow, do I see cops EVERY day?". So piqued, I spent most of January keeping a notebook in the car, and every time I saw I cop, I wrote it down (once I had reached a safe and convenient spot) where I had seen the officer, what branch the officer belonged to, and what he or she was doing at the time. I would count by instances, not numbers of police vehicles. Four cops responding to a call in the International District would count as one, not four. I would only count vehicles, not officers. Foot patrolmen got a pass. Motorcycles, police vans, and those dinky little parking vehicles the Seattle cops used all counted. No fair counting cops parked at police stations. Ditto fire stations and city halls. That's just cheating. Similarly, no counting officers in my living room or at my dining room table (Hi, Dave!). That's cheaty as well. Wreckers, fire trucks, emergency vehicles and anything else that has bubble dome lights is a count for another day. Only count as IDed it you can figure out what branch they belong to. Most of my unidentifieds are motorcycles, since they are hard to pull out affiliation as you drive past them. I ran this for the first four weeks of January. My normal commute is down Benson and Talbot to Renton, then north to Bellevue either by I 405 or back roads, depending on crowds. Once a week I would drive to Federal Way for comics, and once a week I would drive downtown to the ID for Tai Chi. Upon looking at the notes, I saw that I rarely traveled on weekends, staying home to work, and though I would get out to play games with friends, I did not rack up enough instances to really rate them, so I'm taking Sunday and Saturday off the table. Note - Wednesday gets the big number here, but that makes sense because it is the day I'm doing Tai Chi downtown and getting comics. More travel = more sightings. But Friday is not out of the ordinary as far as travel but gets a higher number, while Monday is the slowest day. So if you're going to violate traffic laws in the Renton and Bellevue areas (which this blog does NOT endorse), Monday is your best day. There is a surprise there, but one I did not expect. Lake Washington Blvd. is a noted speed trap for drivers who are avoiding I-405, the main artery between Renton and Bellevue, but it pales compared to local cops in Bellevue proper, or along Benson and Talbot, which seems to be a new hotspot in the evenings for squad cars. So we have here an embarrassment of riches for the various departments keeping an eye on the streets. Renton and Bellevue have the lion's share, which is to be expected. Most of the Unknowns are, as noted, motorcycles. The others are New Castle, Redmond, and Auburn, but oddly enough, nothing from Kent, where I currently live. The vast majority of the cops were in motion from one place to another for reasons unshared with me (my lone Redmond cop I picked up in Bellevue and followed all the way to Federal Way). Responding was in motion with the lights flashing. Tickets, Accidents, and Breakdowns were all pretty obvious. Parked is a none-of-the-above situation, where they COULD be waiting for the unwary, but I have no proof that they were not reporting in, doing paperwork, or just keeping the speed limit down by their presence. So did I learn anything (besides the fact that there is probably a better way to do tables on Blogger)? Just a bit. The sample size is still pretty small, but it shows that there are likely heavy and light days in rotation, that the bulk of the police seen are in motion, and that supposed legendary speed traps were not, and new ones may be opening up. If anything, this type of activity needs more spotters and a more cohesive way to manipulate the data. In short, enough with the long-hand calculations - there's gotta be an app for all this. Next up? Sketchy research on why there's never an officer when you need one. The K of D: An Urban Legend by Laura Schellhardt, Directed by Braden Abraham, Seattle Repertory Theatre through February 20th. Before getting to the heart of the matter, a detour into the bidness side of show bidness. You'd think that holding season tickets might render you immune to the long touch of fund-raising for theater, but such is not the case. If anything, you are moved HIGHER up the list because you actually GO to theater and you enjoy it and should be disposed to part with a tad more to keep the lights on. One recent phone fundraiser from the Seattle Rep was refreshingly honest - "I know you gave us money, but we were damned fools and spent it, so we're back." Probably the best pitch I've heard in years, but I still put him off, saying that the Lovely Bride handled donations (which is true). And she kicked in a bit to help out the Rep at the end of the year. And those contributions go to thing like the Yes Project, dedicated to getting more young voices on the stage and more younger butts in the seats. And K of D is a part of one this Yes Project, and though most of the audience was considerably grayer than the target demographic, it is an excellent start. It is a one-actress show, the actress being Renata Friedman, who plays The Girl, and moves with quicksilver grace as she inhabits the other characters in the play, holding down multiple ends of the conversation, downshifting from animated bounds to a dancer's stillness, holding the moment, containing and embodying the story. The story itself (as we get to the heart of the matter) is about story-telling, in part, and the growth of an urban legend. But is it also about the hermetically sealed world of the young, before consensus and convention and even reality has a deepening effect. It is a place where magic still exists, when magic and the uncanny, is the best interpretation of the events of the larger world. The place is a small town in western Ohio, and the urban legend is about Charlotte McGraw who loses her twin brother in an accident, stops talking to people, and picks up a strange and deadly superpower. Charlotte's silence is portrayed with mute delicacy, but the rest of her pack, the gathering of young teens who hung out together, do enough talking. We're thrown into their conversations early and without proper IDs, but The Girl doubles back and soon we know that Becky always has a cig and Stephanie has that squeaky fearful voice and they become internalized. They are the stable ones in this town, in their own way of thinking. The adults are quirky with a good layer of menace beneath it. Charlotte's mom is a teacher with a bit too much competitiveness in her heart. Charlotte's dad is a bit of a thug, but a bigger thug is Johnny, who hit Charlotte's twin with his rusted blue Dodge as is the unrepentant villain of the piece. We start out telling stories about telling stories, but soon settle into the real tale of watching an urban legend unfold. Friedman is all the characters, shifting smoothly from one to another. But this is no monologue, but as the stagecraft and in particular the sound couples and supports as an invisible partner, from the voice calling off-stage to the frogs and the closing of a lid on a glass jar. Friedman is perfectly timed, creating that bit of misdirection that is part of the magic. (OK, I will throw in one gripe - they identify a heron's call at one point, but use a loon instead. Loons sound mournful and sad, while herons sound like a bag full of ratchets. It's a small point). And at the end, its the type of play that people who don't go to see plays should go see - it doesn't have a big name or a big issue or a big meaning. It is solid and powerful and well-written acted. I liked it, and the Lovely Bride loved it. On the way out, she said "Well, that's the best hundred dollars we've ever donated." Steve Lammert posted this up on his Facebook Page, and I had to share. Godda say, it made me tear up n'at. The problem with the permanent record that is the Internet is that every photo, comment, and action has the chance to resurface suddenly and without warning, creating that embarrassment of looking back at your college photos at any time, and a reminder of how the years have worn on. Case in point, the photo to the left. 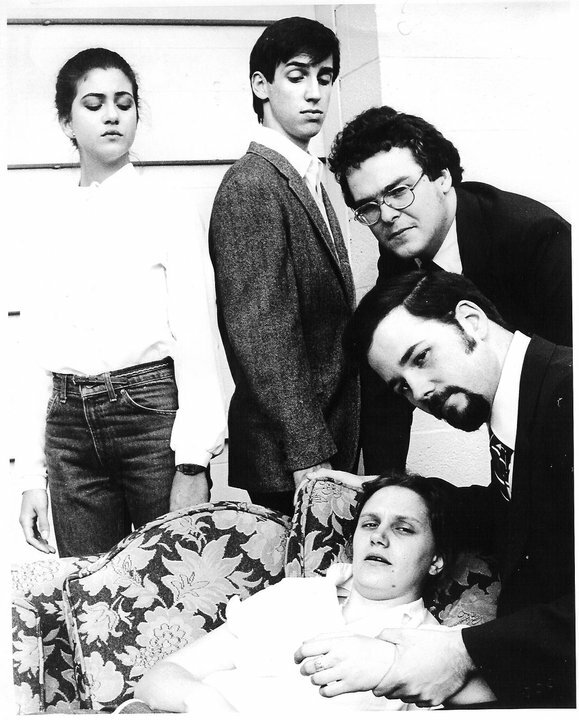 It is a promotional shot for the South Park Conservatory Theater's production of Agatha Christie's Ten Little Indians (Also called "And Then There Were None"). The time is thirty years ago - 1980 would be my guess. And the players were all part of my D&D group. Let me back up a moment. The Lovely Bride's mom, Nardi, is an actress and a stage director, and at that time was involved with South Park Conservatory Theater (which was situated in South Park a large county-fair-sized park south of Pittsburgh). They were doing a production of Ten Little Indians (yeah, it goes by other names, but that was the one we used), which is a manpower-intensive plays - a lot of roles to fill. A bit of a challenge for straw-hat volunteer theater. So Nardi turned to her daughter's D&D group, which met regularly at the house. She had already grabbed me for a production of Arsenic and Old Lace (I played one of the cops), and she recruited some of the rest of the team to fill in the other roles. We were all murderers, of course, of one type or another, and are bumped off over the course of the play. The young lady to the left, I fear I have forgotten her name, played Emily Brent, transformed into an elderly woman through the wonders of makeup. Next to her is Kirk Botula, who now is COO of a tech firm in Pittsburgh, but at that time was playing Anthony Marston, an effete twit who presages his own death with a toast at the close of Act 1. Next to him in yours truly, with my stern grown-up face on, since I will be aged as well to play General Macarther (No, not that one), who sent his wife's lover to his death during the war. Next to me is Jeff Liebmann, who posted this photo to Facebook in the first place, as Doctor Edward Armstrong. Jeff's now a Unitarian minister, and still has the beard. And reclining on the settee is the Lovely Bride as Ethel Rogers the maid. All of us were second bananas who would add to the body count. It was summer stock and it was fun and it showed I had a high forehead back in those days, and that my hair was not more manageable than it is now. And while I have not descended into the full grey-haired, wrinkled look of the old general, I have picked up a few grey hairs and wrinkles along the way. I think there is a PHD dissertation, a heavy coffee-table book, and a permanent spot as a pundit on NPR for anyone who creates a definitive history and analysis of bumper stickers and similar vehicle personalization devices. From mudflap girls to fake bullet holes, from "Don't Mess with Texas" to yellow ribbons (now sadly in decline, despite the fact that we're still in Afghanistan, people), what we put on our cars is a window into who we are and what we want others to think about us. And recently, I've hit two new phenomena, which I have chosen to name for lack of better things to do. The first involves Tombstoning. I noticed this a couple times over the past few months. The entire back window of the vehicle ahead of me is taken up by a full decal saying in something along the lines of "In Loving Memory - *Insert Name Here* - You Will Be Remembered". The vehicle itself has been turned into a memorial for the loved one, with the back window of the vehicle its epitath. I find this touching, but also started wondering - is there a time limit on vehicular mourning? If another loved one dies, do they get the slot, or would a simple additional line merit? Is it bad taste if the deceased died in a vehicular accident, or merely ironic? Does it effect resale value? I don't think Miss Manners has the answers for these questions. The other new effect is something I'm calling Breeder Tags. They are pretty popular, and you see them on the back window of vans and SUVs. Usually it is Dad, Mom, and a number of kids, divided by gender and sometimes by age/height. I know this one has gone national, since the ones I've seen have been Disney-inspired, where everyone except the girls are wearing Mickey Mouse ears (and the young girls are princesses). Part of this strikes me as justification - I need the big vehicle because I have a lot of kids to haul. I'm cool with that, though I notice that some are a little be disingenuous - What looks like a large family at first blush turns out to include dogs, cats, and even goldfish. Now your back window is not an IRS form, and you can claim as many dependents as you choose to stick there, but it just doesn't stand up under examination. It feels like a criminal use of the inherent promise of a "Baby on Board" decal. And there was one set that combined the first development with the second. It was a set of breeder tags in the lower left-hand corner with one member positioned at the top of the windshield, with wings and halo. And all at once I am consumed by the sadness of losing a child and creeped out by the fact that you'd want to broadcast this to people zipping along at 60 MPH on I-5. Over to the right, there are a bunch of online comics that I read. One of these is Girl Genius, which is a very cool "steampunk romance/mad science" strip by Phil and Kaja Folgio. With me so far? Now, Phil and Kaja have written a novel, Agatha H and the Airship City, from Nightshade Books (which is a small independent publisher of really good SF novels, but I digress). It is a novelization of Agatha's origin story. And said book is available at your local independent or chain bookstore, or online at Nightshade or at sites like Amazon. The plan is that, if you want to buy the book, buy it today. That way there is a bump in the electronic sales (it is at #27 in books at Amazon as I write this). It's a birthday present for Kaja. Also, if you're in the Seattle area, Phil and Kaja are doing readings in the area over the next couple days. Am I buying the book? Well, to tell you the truth, I bought it a while back, at my Local Comic Store. It showed up there just before Christmas, and made a great gift for the Lovely Bride. So if I can get it back from her, I'll read it. No, really. With the new year we bring into being the latest crop of new collectible quarters from the US Mint. And as in years past I'm going to go over the designs with sarcasm dripping from my cudgel of kindly observation. For those who tuned in late, the US Mint, having successfully launched the state quarter collection, is doubling back and taking a second dip, this time with a "National Parks" series. Actually, since not all states HAVE National Parks, it is the National Parks/Forests/Monuments/Recreation Areas series, and is also referred to as the "America the Beautiful" series. One thing that has struck me is the improvement of technology and design since the state quarter program. I think the designs are more challenging then they were previously (see - Wyoming's State Quarter) in their attempts to show depth of field with a bas relief. Similarly, the subject matter is more concise and directed than the grab-bags you see in then previous States collection. On the other hand, the challenge of showing natural vistas or national battlefields loom large, as getting a message across in the space of a small circle. One of the great battles of the Civil War, which, with Vicksburg (see below) sealed the fate of the Confederacy, shows Abner Doubleday preparing to lay down the first official bunt in baseball. No, no, I'm sorry. Actually, this is the monument of the 72nd PA regiment, which fought at the Bloody Angle and caught Pickett's Charge in the teeth. It is a great monument (but that's another series of blog posts) in that it captures the feeling of the hand-to-hand combat, but the statue probably gets the nod over the other monuments because it is PA's coin. Home field advantage, you know. The coin itself captures those levels of depth I was talking about. We have the partial cannon in the foreground, making this feel more like a window than a display. The monument itself is centered and has the dominant white space. But beyond it we get the rolling hills and farmland of Pennsylvania which sets the monument into the greater world. The monument itself was the center of a fight that reached the Supreme Court, by the way. The rules for placing monuments (yeah, they have rules), a battlefield monument should be placed where the main line of the battle existed. In the case of the Angle, the 72nd PA was driven back by Pickett's Charge, rallied, and fought back to the original front line. The Supreme Court ruled in 1891 that the monument should be placed at the original line of scrimmage instead of counting any forward progress. Talk about a booth review on the play. So here's the problem of trying to create perspective: It doesn't always work. The intent here is to show the mountain goat on an outcropping in the foreground, with pines in the middle distance, and Mount Armadillo-Head Reynolds in the background. The problem is with little or no white space, we have little feel for perspective, such that we either have dwarf pines or the mountain goat is the understudy for Paul Bunyan's big blue ox. Further, the musculature of the the furry goat blends too easily.with the rocky outcropping behind it, with a deep cut along the goat's back is the only strong defining line (which in turn looks like the mountain ridge behind it). As a result, the goat disappears into its background like carved chameleon and the resulting coin is a muddle of textures. So this comes out of the same kit as the Glacier Quarter - Animal, Trees, Mountain - ship it! But this works a bit better, because in part of the use of the white space of the Hoh river to clear up an otherwise muddled lower half of the coin. The elk has a clearly different surface treatment than the background, so it pops from the plane of the coin. Still, it is the part of the scenic mountain series that we have seen way too often, even if it features Mount Olympus, which always gets second banana treatment when compared to Mt. Rainier. And the little splashy marks where the elk steps in the water? It looks like we're dealing with the rare electric elk, and soon salmon will be floating to the surface, shocked by its lightning hooves. American History is filled with internal conflicts and divisions, and none so bitter as when Dr. Loveless sailed his steam behemoth up the Yazoo river, and was only foiled by Secret Service agents James West and Artemis Gordon. OK, its really the USS Cairo, which was not AT the final Siege of Vicksburg (which was wrapped up almost simultaneously with the Battle of Gettysburg, creating an interesting dualism in the coins). The Cairo had been lost the previous winter on the Yazoo, but was later raised and is now on display at the Vicksburg National Park (there were gunboats at the Siege of Vicksburg - just not the Cairo). So Mississippi has a coin dedicated to a Union victory, depicting a Union gunboat flying union pennants. I think it is a very gutsy move, but I can't wait for the nutters to get wind of this one. As a coin, I have to say that this is really impressive. Single image, dynamic, good balance of white space and carving. It is probably the most industrial coin we have seen, practically a steampunk quarter, and will probably be the coin the people really look at when it shows up in their change. Unlike the plethora of natural vistas with wildlife (Not that I'm pointing any fingers .... WASHINGTON). This is the tough thing about giving every state their own National Park quarter - not every state has a National Park, and even when you spread it out to include memorials and recreational areas things are still pretty thin on the ground. Case in point, Oklahoma. The Oklahoma City National Memorial would have been most dramatic and meaningful, but the bombing of the Alfred P. Murrah Federal Building is still a raw wound in the American psyche, even 15 years later. Fort Smith is part of the Trail of Tears, and Washita battlefield commemorates Custer's attack on Black Kettle's Camp. Neither of the two is great grist for national coinage. So, Chickasaw, which the National Park booklet describes as "An Oklahoma Oasis" (which, of course, says something about the rest of Oklahoma). It is a nice, verdant park with mineral springs and creeks and not a lot as a stand-out feature. Except, maybe, for the Lincoln Bridge, depicted here. Built in 1909 to celebrate the centennial of President Lincoln's birth (giving us the Civil War trifecta with this year's coins), the bridge itself just celebrated ITS centennial, making it a favorite as a historical feature. So that's why a coin for Oklahoma has a very un-arch-typical Oklahoma scene. The coin itself is not horrible at all. It actually has a sends of balance from left to right with the river banks, and from top to bottom with the mirrored white space of stream and sky. The addition of the birds in flight both underscores native wildlife (which must have been in the design document for a lot of these coins). The bridge melds into the treeline behind it, but may come out better in the final casting. In short, it is a completely suitable rendering of a relatively obscure and traditional feature. And it still better than the West Virginia state quarter, another coin-with-a-bridge. Rating B (Not bad, but when it is all said and done, it is STILL just a bridge). And that's it for this year. Tune in next year for the "All Points of the Compass" edition - Maine, Alaska, Hawaii, Puerto Rico, and, um, New Mexico (OK, one of them would have to be more in the center). Yes, the rumors are true. 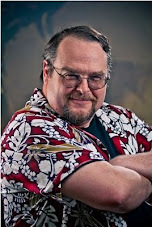 I am helping Wolfgang Baur and some very talented writers with creating a Midgard campaign setting, exploring the world that Kobold Quarterly has placed its Free City of Zobeck. And by "helping", I currently mean, "asking a lot of pointed questions about the world and how we build campaign settings in general." Hey, we even have a trailer! So Friday I took the day off from work, with the excuse to go see the Picasso Exhibit at the Seattle Art Museum (SAM for you non-locals). The SAM itself merits its own entry, so let me concentrate on the exhibit itself. And mention the crush of people who ALSO decided that that last Friday was the time to go. So there were a LOT of people, such that with timed ticket and two sets of lines, it was a crush of school kids, old folks, and bozos like me listening to the provided audio track (and kudos to the young woman who thought enough of others to park her stroller in the media room and carry her child, just like in the old days. You, my dear woman, rock). So Picasso himself, I've had mixed emotion about. On one had he is Twentieth Century Art with a capital "A". On the other hand, the process of the art is such that it becomes unmoored from representational art and starts drifting, balloon like, into an emotional realm. What that means is, that when it works, it works very, very well, and when it doesn't, you end up scratching the side of you head and asking "Is that a nose? Is that an idealization of a nose?" When I was young LIFE or LOOK magazine did an article on Picasso (this was in the 60s) and then two weeks later ran a series of letters, each one of which declared that their seven/six/five/four/three/two year old could paint better. Which is part of the point and nothing like the point. This Picasso, he confuses me, and I think he wanted it that way. The exhibition itself comes from the Musee National Piccaso in Paris and reflects works that the artist considered part of this legacy, and consists of finished works as well as sketches, studies, and uncompleted projects. That gives an idea of what lies behind the thinking, as well as minor or personal work. Les Demoiselles d'Avignon is not here, but represented by similar works, and Guernica shows up as preliminaries and a photo-progression of the work shot by one of his lovers. Yet he has generated so much material, in so many different media and in so many different ways, that the entire experience is unexpectedly overwhelming. I overheard one patron say that he felt like he had just left a Thanksgiving dinner - he was overloaded on art. And of the art, yes, the early Blue and Rose periods show him capable and establishing himself as an Artist-with-an-A. It is his cubist work that connects for me at the most basic level - I find the transformation of figure into planes and the creation of motion through angles to be exciting. This is the part that works. And yet after this, as it moves most fully into Picasso' style of teardrop shapes and morphable eyesockets that I lose a bit, that the excitement is not as present. It feels like he is doing art because that is what he does. My greatest surprise was to find Massacre in Korea at the exhibit. 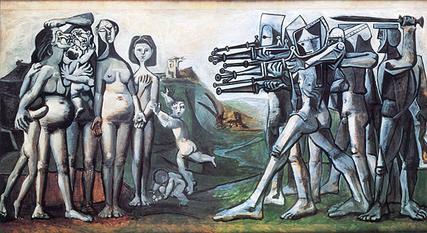 A "sequel" to Guernica, inspired by Goya's The Third of May, 1808. I had thought its purported subject matter was part of the resistance to the work (it was supposedly critical of American involvement in Korea, and it easier to chastise fascists than Americans), but now dealing with the piece up close, I find that it is effectively a lesser work - clunky where Guernica was fluid, heavy-handed where Guernica was universal. The message is clear, but execution fumbles. Sometimes he was pushing the envelope to see what lies next, and sometimes Pablo Picasso was following in the well-trod path of ... well, Pablo Picasso. The exhibit is in town for only a week more, and worth cutting class to see it. Good luck with the crowds. ArenaNet celebrates its tenth year anniversary with a retrospective about us, our games, and our world. Enjoy. Last night we had an New Year's Gaming Eve here at Grubb Street, and had a very nice evening indeed, with a variety of games played, in particular expansions of games we already knew. I asked the Lovely Bride for a Christmas for a game we could play together. Usually that is my job in the relationship, and we would end up with a nice European board game or something for Playstation 3 (we just finished the Indiana Jones Lego game after a year or two). I discovered that I should NOT leave the LB alone in a game store with such a directive, since she picked up THREE expansions - for Settlers of Catan, Carcasonne, and Alhambra. Plus I had an expansion for Ticket to Ride that I hadn't cracked open yet, so this became a gaming session to play expansions. Board game expansions are a little wonky, or rather wonkier than RPG expansions. How far do you go with it? Are you looking to create a new experience with well-known features? Are you seeking to extend the experience of the original game? Are you trying to correct weaknesses in the original? Are you trying to make a popular original (which would be one reason to do it in the first place) even more popular? It is sort of like movie sequels, and filled with many of the same perils. Carcasonne: Princess and Dragon. The original Carcasonne is a tilebuilding game with a lot of quirky little rules in it (we tend to play the later Carcasonne: Hunters and Gatherers, which is set in prehistory and is a bit more streamlines). One of the challenges with Carcasonne is that it is like watching someone put together a jigsaw puzzle for most of it. Indeed, the game pulls people together as someone gets a city piece that he can't put anywhere, and people start lobbying for a particular play to help themselves. In addition, the original game had a problem with "mega-farms" - large, sprawling amounts of territory that will tip the game for one player. The Princess and Dragon expansion is billed as taking the game into fantasy, but actually takes it more into randomness. New tiles bring into play and move around the Dragon piece, which takes pieces (meeples) off the board. The sudden swinginess introduced prevents someone from taking an early lead and holding it, but proceeded to carve a huge swath of empty cities, untended farms, and abandoned cloisters through the center of the map. We went through a phase where the time-honored strategies were suddenly blowing up in our faces, and quickly descended into a giggling mass of disaster. Result: It did make the game more fun by making it less serious. Your well-thought-out play can be overturned by a Dragon rampaging through your home. Settlers of Catan: Traders and Barbarians. The original Settlers is a classic, the first to hit the beach in the new wave of European Boardgames, and remains an excellent game to teach people who has grown up on Candyland and Monopoly to show that board games don't have to be boring. It is nearly a perfect game in itself, the Platonic ideal, which makes it tough to expand. Traders and Barbarians is a bunch of individual expansions which could encourage repeated play, but the sheer number of them left the gang unwilling to experiment - after one "reminder game" to teach new people, we moved on to other activities. The addition of Fishermen, Camel caravans, and Barbarian raiders looks interesting, but it is toy box that will have to be sifted through. Ticket to Ride: 1910 Edition. The original Ticket to Ride was brilliant and flawed. A train-building game that was easy to access, its small cards were difficult for the young and the old to shuffle, and its game play (determined through routes pre-selected on cards) tended to funnel everyone through the same corridor of the Mississippi valley, which made for frustrated play and nearly destroyed relationships. 1910 is a patch that works nicely - New decks of reasonably-sized cards, plus a 1910 deck of destination tickets, which concentrated on more east-west lines than north-south lines, making the valley of death less frustrating. Using both original and 1910 cards produces a much more random game where what tickets people had were not as clear. Alhambra: First Expansion. The original Alhambra is another excellent core game involving tile-building a city, and buying those tiles with four different types of money cards. This expansion creeps around the edges, tweaking the game with small improvements that increase complexity without gumming things up too much. There is now a mechanic to interrupt the game to grab the city piece you really want. There are cards that let you change one type of money card to another. There are bonus cards that make you want one particular piece very, very much. And there are worker's tiles, which can increase in value depending on their adjacent tiles. We added ALL of these, and found that the original game stood up very well, and encouraged people to engage with the game when it was not their turn. That's the lot of them, for the moment. In general, expansions, like the games themselves, vary in success. Carcasonne created a very different game, while Alhambra's deepened the play experience and Ticket to Ride's patched some issues. I don't make resolutions, but were I to make one to play more games, I would say that I was well on the way to keeping it.